Jemima Hubbs married Charles Saylor in 1812 and it is through them that I get my surname. In the early 80's, while visiting the museum in Wellington, ON, the volunteer attendant asked my surname - Saylor. She jumped with excitment and exclaimed, "you are a Quaker!" My family had no knowledge that we had Quaker roots. She told me how to get to the old Quaker Cemetery in Bloomfield and there I discovered the line of Saylor headstones, Jemima among them. 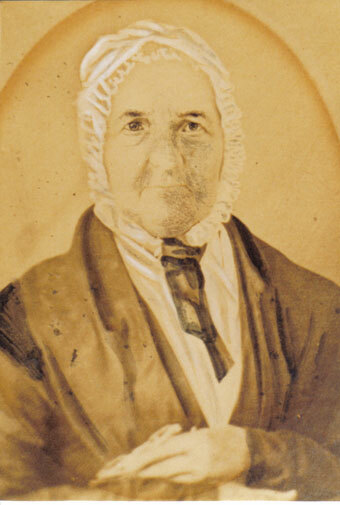 Jemima Hubbs was a Quaker and she married Charles Saylor, a non Quaker, in 1812. For this she was nearly disowned but did live her full life as a Quaker. In the mid 1980's I visited Rachel Burnett, now deceased, a Saylor descendant living in Wellington and she had a photo of Jemima wearing her Quaker bonnet. She also had a lovely 1899 photo of 4 of Jemima's sons. Rachel kindly let me copy them. The Saylor brother photo was given by Rachel to the PEC Archives. Jemima is the daughter of Quakers Robert Hubbs and Jane Haviland. Researching the Haviland side of the family has been a challenge and it appears that Jane had a brother John Haviland who also came to Upper Canada. Jemima Hubbs, 16 Oct 1790 - 18 May 1876. Dates from Saylor Family Bible, possession of WRS. Robert Hubbs and his wife Jane Haviland, parents of Jemima Hubbs, lived in Long Island and removed from the Westbury meeting to Upper Canada in 1799. The removal certificate was sent to Nine Partners which at that time was the Monthly Meeting overseeing the Adolphustown meeting. It is assumed that Jemima was a Quaker by birth. In 1812, Jemima Hubbs was disowned for marrying Charles Saylor, a non Quaker, but in 1817 she was restored as a member of West Lake meeting by acknowledgment. In 1828 she stayed with the Orthodox branch and was a life long member till her death in 1876. She is buried in the old Quaker Cemetery in Bloomfield, ON. 2. On 21, 2 month, 1811; Jamima <sic> Hubbs is the subject of a 'complaint' for 'going out of plainness". A committee is struck and they report that 'they have visited her to a good degree of satisfaction and she being desirous for friends to bear with her'. 5. On 16, 8 month, 1812; "The case of Jemima Hubbs on account of a complaint which came against her in a former minute and ??? appearing also since married out of the Unity of Friends for which conduct we are united in her being disowned and having the concurrence of men, she is accordingly disowned. Charity Terrill and Philadelphia Cronkite are appointed to inform her and report." 6. Note: The family Bible in the possession of WRS states that Jemima Hubbs and Charles Saylor married on April 02, 1812 in Hallowell. This date is consistent with these minutes. Clearly, Charles Saylor was not a Quaker and for marrying out, Jemima was disowned. Many Friends were disowned for this offence and in a few cases the Friend was successful at pleading 'acknowledgment' for their action and was allowed back as a Friend. Jemima was disowned and and in 1816 was admitted back as a member. 7. On 10, 12 mo. 1816 "An acknowledgement was handed to this meeting by way of the overseers signed by Jamima Salor after solid consideration there on it was directed to the Monthly Meeting." 9. Jemima Sailor named as a member in West Lake in 1820 and again in about 1830 as an Orthodox Quaker. Husband Charles not named. Same spelling in all cases. 10. 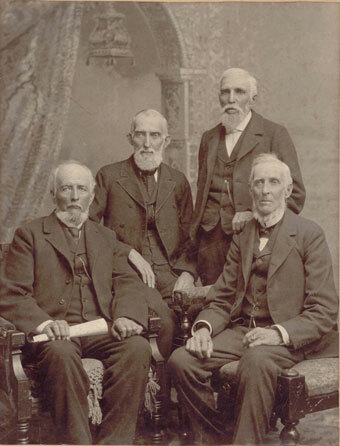 Son, Robert Saylor, testified to the Supreme Court of Canada in 1886 about the schism in the local Quaker community. In support of his long time role in the Society of Friends he said "my mother was a Friend." In 1864, Jemima's daughter Anna (the tenth child) died at the age of 33, leaving 8 young children. By the time of the 1871 census, Jemima was 81 years old and had moved to her own house, in Bloomfield. She owned a home on 114 acre of land in garden and orchard. Jane Elliot, a 20-year-old servant girl, lived with her to help her with the work of the house and garden. "Old Mimey Saylor died age 87 buried 21st" - diary entry dated May 19, 1876. Source: Births, Marriages and Deaths of the Bloomfield Area. Exracts from the Diary of William Degroft 1869-1902. Compiled by Don Kellaway, 1994, Quinte Branch, OGS.